At this moment we are using Visual SVN and we are backing up the entire repositories directory for visual svn. This backs up the entire data for each repository inside our svn engine. I am curious if I will be able to restore those files in case of an emergency or a disaster? Any of you have experience with this restoration procedure? Thanks. It describes using the Subversion commands to take a backup. I hope this is what you are doing already because taking a straight directory backup can result in having a non-usable repository. You should be able to use the backup from the Subversion and use svnadmin dump or svnadmin hotcopy command to restore the full repository. However, as with any backup strategy, you must test the restoration yourself to be sure it works for you. Starting with VisualSVN Server 3.6 version, the server includes a built-in scheduled repository backup and restore feature. Moreover, the 3.6 release adds scheduled verification of SVN repositories. Setting up scheduled repository backup and verification for your Subversion repositories is only a matter of minutes. 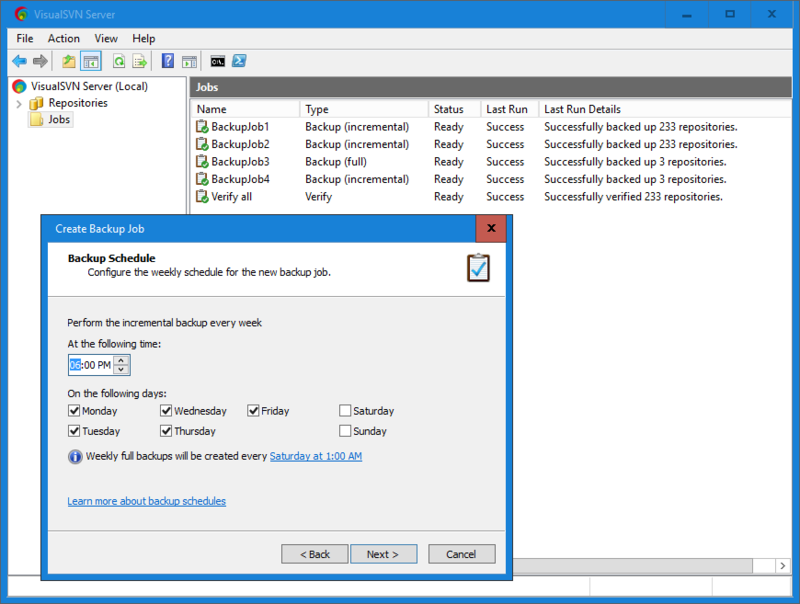 For step-by-step instructions, please see the article KB106: Getting Started with Backup and Restore. If you look for a one-time backup, you could use Backup-SvnRepository PowerShell cmdlet. To recover the repository, use Restore-SvnRepository. These backup cmdlets are available beginning with version 3.6. Download the latest version of VisualSVN Server from the main download page. There are several methods to backup VisualSVN Server repositories. Check the short description below. svnadmin hotcopy allows you to make a safe copy of the repository, regardless of whether other processes are using the repository. You may write a custom script which will do the backup for your repositories on a regular basis. This is the incremental backup method. Incremental backup method backups only the portion of the repository data that has changed since the previous backup. You can set up this tool to work as "master" and "slave" and duplicate any commits to its repositories automatically. (To install Windows Server Backup, run ocsetup WindowsServerBackup in elevated command-prompt). Windows Server Backup wizard (control panel, actually) MMC snap-in. It's not required to stop server's service when you run the backup because FSFS repository backend is always in consistent state. Recover backups to an empty directory to make sure that restored repository files won't mix with files of the broken one. After repository if recovered, you can delete broken repository and then replace it with the recovered one. Stop-start cycle server after recovering repository from a backup. If your clients get errors after repository recover, run svnadmin recover against it. The command finishes instantly and makes repository accessible again. Authentication and authorization files that are stored in the repositories root ('C:\Repositories' by default). Depending on your settings, there should be the following files: 'authz', 'authz-windows' and 'htpasswd'. "%VISUALSVN_SERVER%\certs\" folder where information about your SSL-certificates is stored. "%VISUALSVN_SERVER%\conf\" folder where configuration files of your VisualSVN Server are stored. "HKEY_LOCAL_MACHINE\SOFTWARE\VisualSVN\VisualSVN Server" registry key where other part of server's configuration is stored. Also you can rar/zip it to save space. I was using the same method when I moved SVN from Linux to VisualSVN, so this backup works as it should. The easiest and best way to make backups of a SVN repo is to use svnsync. Its an incremental tool that replays any commits to a backup repository. Its easy to get going - see this blog post - and its fast as it only sends changes. You will have to set up a post-rev-prop-change hook to catch the 'edge case' of when someone updates a historical revprop, but otherwise you can run it hourly (as I do) to keep backups continually. you can even run it in the post-commit hook if you're really paranoid about data backup! If your live repo dies, you can then just "svn relocate" to the backup repo until you have your live one running again (though, be careful if you write anything to the backup whilst the live is down unless you run svnsync to get those changes applied to the live repo, which is pretty obvious when you think about it). So you have continuous backups, and downtime measured in seconds using it with minimal resource usage. Backups don't get much better than that! Another option is hotcopy. It makes a back up of your entire repository. Takes up more disk space, but very easy to run and also very easy to restore repository using this. VisualSVN is a Windows product so it'll be running on Windows. If the backup utility is able to use Volume Shadow Copy to make the backup, then that should produce an internally consistent backup. The built-in NTBACKUP or third party software such as Symantec Backup Exec, or the disk-based backup tools built into Windows Server 2008 are all capable of using Volume Shadow Copy. I use the following cmd script - It dumps all sub folders of the repository root to the backup path and 7-zips them. set svnAdminPath="C:\Program Files (x86)\VisualSVN Server\bin"
svnadmin dump "%repoPath%" > "%backupPath%\%dumpFile%.dump"
Not the answer you're looking for? Browse other questions tagged windows windows-server-2003 backup svn visualsvn-server or ask your own question. How can I do daily backups for my VisualSVN Repos? Should I migrate from VisualSVN to Collabnet Subversion Edge? What's needed for a complete backup system?